oooh, I want to go stay at this hotel. Is the wine good? the food looks great! never really had a great Italian wine. Anybody have suggestions? I drink only italian wine, sometimes spanish...don't like french grapes. Are you a red wine or a white wine girl..you like sweet or dry, woody? I can give you some tips. I'm all for the stronger and darker redwines. Nice red wine grapes are Sangiovese. I don't know what you can get in the US, but you cannot go wrong with a Sangiovese if you ask me.Chianti usualy has 70% Sangiovese..I like the pure stuff. Morellino is also a Sangiovese grape. This wine is very intense..love it! 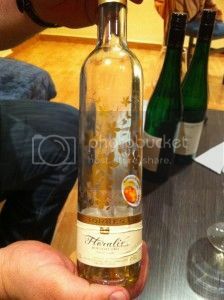 If you can get a dessert wine called Floralis Moscatel Oro from Torres you will be a happy girl. Its a spanish licor wine and it is the best! not for during dinner, but before or after. Keep it in the fridge and drink it cold. I never think of chianti as a great wine and do know the sangiovese grape. But I always favored the Cabernets and Merlots. We do have an Italian shop Vince & Joes I bet would have Doppio Passo. I'll stop in soon! btw -the color of the season is a bloodred. @Giba I googled Vince & Joes, what a beautiful store. I'd go broke overthere they will sure have some nice wines for you there. You did already find that Sangiovese/ Merlot that was nice. @Caroli...I can't read the site...is it in Portugese. Did know some spanish 20 years ago, but thats nog spanish is it? That certainly looks deep and dark Caroli! I'd love to visit the vineyards of Europe! I tried to make mint granita today...but that crapy icecream maker killed it again. So that thing will no longer be filling up closet and fridge space. I'm throwing it out. Stormey -so is granita like Italian ice? we made it here and added lemon juice or other flavorings and surprisingly it was good! pfoei..that's a depressing video..didn't watch it all the way. I eat lots of Granite when I am on Lipari. They go out in the morning to pick fruit and make it in to Granite. It's so fresh, I just can't say no to it. They should make Mojito granita..I'll be living at the Gelateria! yeah she's from the great depression era. But her recipe is simple, cheap, and it all depends on what you add. Mojito -sounds great on that ice! why don't you make it and youtube it!! I enjoyed another caprese' salad today -fresh tomatoes and basil from my garden! Got to love Insalata Caprese..it is so nice! My kitchen is way to small for youtube filming..really and I wonder if Mojito Icecream would really freeze because of the alcohol, but it sure is worth a try. Need a new icecream maker though..thrown mine out last week. I stayed up late last night, because I couldn't sleep and made a beautiful eggplant soup in the middle of the night. Don't know if my neighbours liked the sounds of my kitchen machineries..but I sure love my soup! so on a whim, I decided to make spiedini tonight. I watched my grandma make it once, so I went shopping and asked some lady if she was Italian (she was!) and chatted about how to and what filling! Came out okay. here's something I ate today! still getting tomatoes and cucumbers from my garden!! w/kalamata olives and fresh mozzarella! Giba7 wrote: so on a whim, I decided to make spiedini tonight. I watched my grandma make it once, so I went shopping and asked some lady if she was Italian (she was!) and chatted about how to and what filling! Came out okay. I don't know what spiedinis are exactly but they look totally yummy!! Giba7 wrote: here's something I ate today! 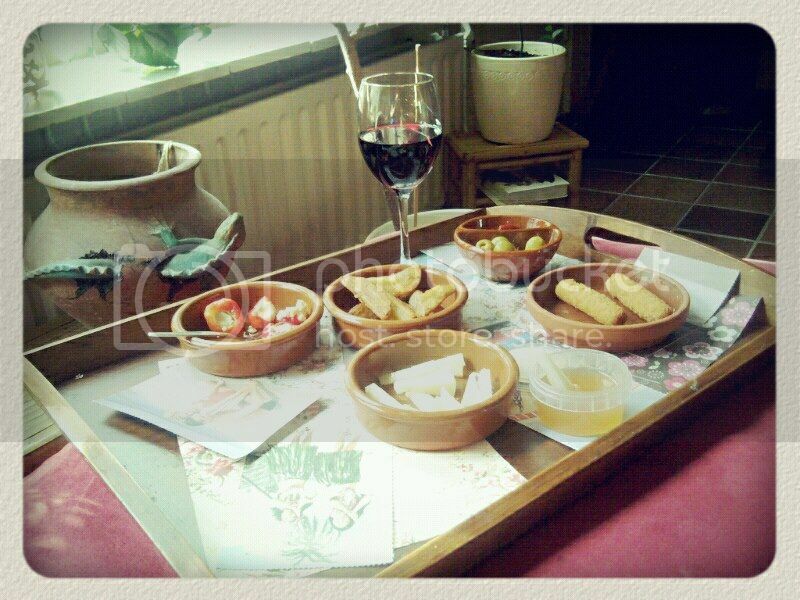 Heeey that looks like a Greek Salad... except that feta cheese is used instead of mozzarella (I think)... Love it!